Lasciati ispirare da Antoni Gaudí con un laboratorio di mosaico divertente e adatto alle famiglie a Barcellona. Scopri la tecnica musiva in stile Art Nouveau dei "trencadis" che il famoso architetto ha aperto la strada, utilizzando frammenti di vetro o ceramica e stuccatura per creare un'immagine totalmente unica e astratta. Scopri dove vedere questa particolare forma d'arte in tutta Barcellona, ​​e poi crea il tuo capolavoro come specchio, cornice per foto o sottobicchiere. Sfrutta i tuoi poteri creativi e porta a casa un fantastico ricordo fatto a mano delle tue vacanze a Barcellona! 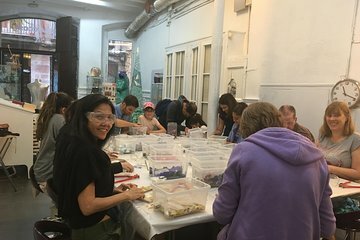 Our 14 and 10 year old sons were absolutely engaged in this activity, and we all enjoyed making our mosaics with the friendly help of the owner and her assistant. We may have benefited from a bit more historical information on the style of mosaic, and a bit more direction as we began on exactly what to do in terms of practical instruction. Travellers should know that the mosaics require finishing, so you do have to come back for them the following day, which required some logistics for us as we hadn't planned to return to that section of the city. But overall, I would recommend this to any family traveling to Barcelona as our children better appreciated the artistry of the mosaics that they saw throughout the city. Our thanks to Mosaiccos! This was a wonderful experience to make something useful in mosaic tile to take home as a remembrance of your trip to Barcelona. Maria Jose, Anna and Angela were great to work with. Highly recommend this activity during your stay.